The UFT Science Committee focused on safety policy and procedures at its Sept. 18 meeting, a timely theme in the wake of science experiments involving methanol at a Reno children’s museum and Denver and New York City schools that went badly wrong in the past year. 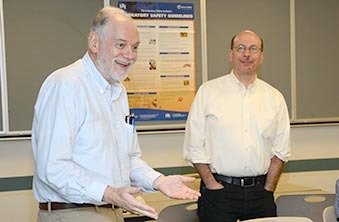 “One part of our discussion was how to avoid doing demonstrations or lab procedures that are more dangerous than they need to be, and the other part was about being very aware of the specific hazards and taking appropriate precautions,” said Lew Malchick, the co-chair of the Science Committee and a retired chemistry teacher from Brooklyn Tech HS. The group also discussed the Science Experiments Review Panel, an important part of the UFT contracts that cover teachers and lab specialists. The panel considers disputes raised by staff Miller PhotographyMalchick leads the meeting as physics and general science teacher Howard Spergel of Midwood HS looks on. members concerning the safety and efficacy of scientific experiments and procedures. It consists of three science supervisors selected by the DOE, and three lab specialists and three science teachers selected by the UFT. No disputed experiment can be performed until the panel gives the green light. At the UFT Science Committee’s monthly meetings, educators and lab specialists from New York City and the tristate area come to share their experiences and learn about resources such as the DOE Science Safety Manual posted on the UFT website.